Just as I was getting poorly I got my hair cut with a view to dying it. Four weeks on it's more like Michael Portilo, not showing pictures of that. There is still no colour on it and actually it needs another cut but I still haven't got my head round booking your next appointment when you leave your current one. This is my policy for the dentist I am not sure why I can't transfer the data from teeth to hair as it is a successful system and I am sure would make me feel more pretty more often. 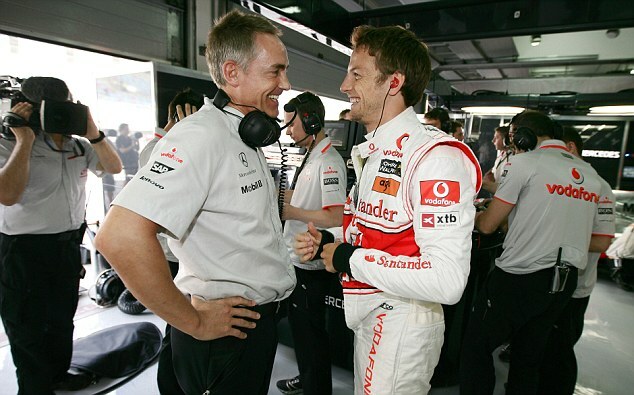 A little bit of insider information is that I have the biggest crush on Martin Whitmarsh. He is the Team Principle for the McLaren Racing Team. Interviews with him can be the highlight of my F1 weekend. Jake Humphrey and team do a fantastic job in their coverage and everyone seems to get on and from my arm chair their seems to be zero sleaze unlike other sports. One of the reasons that I am a supporter of McLaren is that our friend GW is an engineer working on Ron Dennis's new super expensive motor, I can't remember which bit he is working on, might be exterior, it doesn't matter because he is amazing friend and they are very lucky to have him. Occasionally GW will say stuff like "saw MW in the canteen today" or "MW held the door open for me today, very nice man" he knows it's a nice little uplift in my day. This is the funniest text message banter that we had of late, I am not sure if you will find it funny but I think it's wonderful. You might want to Google McLaren HQ for a clearer picture. Sat next to Martin Whitmarsh at lunch again. was wearing a reasonable plain white faced watch. This is middle class Surrey. Ages ago I bought this castle from the car boot with the intention of saving it for a joint Christmas present but small beadie eyes clocked it the other day and it's cover is blown. G said that the girls wouldn't like playing with it as it is old and sun damaged how wrong he is. They love it and are going to kill each other trying to get the best out of it so we can safety say by the weekend I might have given it away or become the worst shouting mother in the country. T made me stickle brick glasses, they are not as secure as they look. The change in weather has flummoxed me and despite knowing it was coming and I had a fashion disaster at the school gate today. The mums collected their children in beautiful summer prints and leather sandals all with glowing skin. I am feeling a lot better and not so much under a rain cloud but I was dressed for thunder today and I am clearly still far behind in the self maintenance department. We have been given a last chance with the weather I am planning to take the girls and G to the beach for a dinner down by the waters edge and P and I have a playdate in the park collecting conkers which will feel strange in the baking heat. I suppose I should have read my last entries to see where I was last time I posted but actually I believe it was going ON and ON about my health. Although not really because I am anxious about talking about it too much because I worry that If I am REALLY ill then no one will listen.........you know that story. But just to say that I just talked to a lady who I know of who works in our local wool shop and she has had the same chest infection and been just as fatigued and my spirits are lifted because I am not the only one. I didn't want to post too much about being ill because it's got to be depressing to read especially when its really not that serious it's just that in the past I have had no ailment that lasted more than a working week so I am extremely lucky. So two sets of antibiotic on, a skin reaction and a trip to A&E plus a two hour nap with the toddler every lunch I think I might be coming round the other side and here are my comforting tips for anyone coming down with a nasty chest cold. Drink these in any combination - Hot Water Ribeana, honey, lemon, ginger. Wear a scarf no matter how sunny it is outside. Chicken Fowl for boiling is best but otherwise use normal chicken. It just goes a bit tougher. Peel and chunky chop up a carrot and a parsnip and peel a whole onion, don't chop it up. or cook it in a pressure cooker. I bought these they go A LONG WAY and everywhere! The lady that gave me this recipe offered to make it for me and bring it over with Matzo Balls!. She is about to have a baby and is still working in a position that is so valuable in our community and looking after her own family and I can't thank her enough along with every one else that gave to my list of comforts and found five minutes to send words of encouragement as I panicked and whinged. Here is a pic of P who as well as her sister also has chesty coughs. Spending the morning getting tired and lunch sleeping it off. It's dinner time so off to make the magic happen. Stepped in the shower yesterday, brain is on the shake again, we all know that you start at the top and work your way down but I started washing my body first and then cleaned my face with shampoo. So this morning I noticed that in the back of her matted hair she had a yellow thing, with my morning vision I thought it was the hair tie that T had worn to school the previous day. Nope. I had woken in the night and stuffed a throat sweet in my mouth which must have dropped out when I fell asleep and when P came in to our bed in the early hours she had picked it up in her hair and that is where it stayed until cut out. I slept through last night but woke up with what felt like a brick in my chest and the need to clear it out with steam so I popped down stairs but I noticed that I had woken up T. She followed me a few minutes later into the kitchen. With my head in a bowl under a towel she starts. Mummy, there is a girl at big school who walks there on her own. I think daddy should let me walk to the shops on my own and then when I am five I can walk to big school. I am not sure if your father will go for that and I am not sure if I like the idea either. It's because you are beautiful and someone might see you and want to keep you. I know mummy! you put your mouth in my mouth and breath out some of my luvness and it will make your cough better and then I can walk to the shop on my own and daddy will be happy. So I decided that when David Walliams finally made his way into London for Sport Relief then that would be it. No more. So it is done. This has been a strange week or so, it's like it's morphed into a bulge that won't budge. School for T has been great. Safe to say duck to water and she has made it easy for me emotionally but I am still finding it odd. My good friend tells me its getting used to a new routine. I have made her lunch boxes for preschool and got her dressed most days for five years but there seems to be more pressure in the prep for every day, of course her uniform is clean but I just keep going over and over everything in my head. When I was younger I never used to walk next to the edge of our pool (another story) because this invisible force appeared to pull me close to the edge and I didn't like it. This new routine feels like that. I now have a chest infection and antibiotics and I could cough for Queen and country. I feel like I have a small piece of apple just stuck at the back of my throat, Dr. says not the case. I have felt rubbish for what feels like weeks now. The anxiety that comes with it is awful and tears that occasionally flow because I am not able to perform my duty as the mother that I had hoped I would be the at this most exciting time. Today I am feeling a lot better and brighter from inside my congested bubble. So this weekend she wanted to tell stories. With lots more content. I think she is already bringing her school day home. Then she goes on to say how the unicorn is locked away by the evil donkey but it pokes it's horn through the bars and stabs the donkey in the neck. There is also a teaching assistant. According to T his name is Han Ham or Hand. I hope he doesn't mind that she doesn't call him Mister Han, Ham or Hand. The other night I came upstairs for a blanket and she was still awake and sparkly and she told me how happy she was at school, it's was so good swimming and she was so excited that she could cry and she loved it so much and then she put spit tears under her eyes! I sung her a song and told her to go to sleep, which she did whilst looking at me as if I was the best mother anyone could ask for. I had the warm fuzzy feeling different from a temperature! I thought that a lot more might get done this week but it didn't, but I have not done to badly, just a bit at a time with lots of rest. 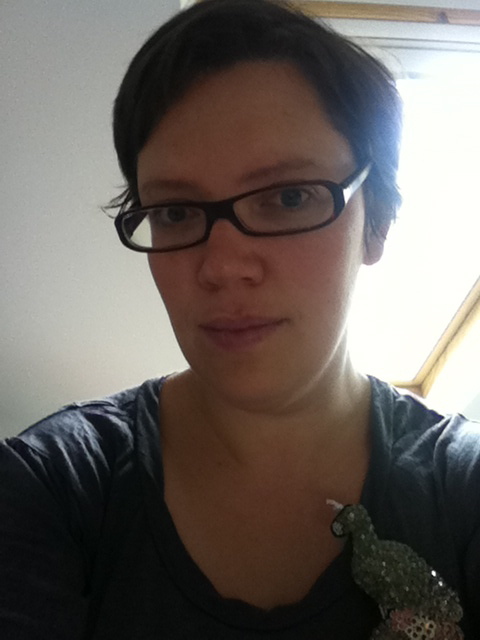 (I do normally have a lot more get up and go when I am sick, really!) But our book shelves need a sort especially as P like to look at them all without their dust jackets on. I happened to find this beauty on YouTube and it such a nice little piece that I am sure even the most minimalist amongst you might give in to a little clutter. Remarkable quality. To be watched with a cuppa I think. Off to the kitchen for more hot blackcurrant because I am so done with honey and lemon. My ears just popped finally. Day Two of School - What the hell has happened? I don't normally feed my girls loads of junk and they have basic tastes luckily for me. Chocolate cake is about as experimental as T gets but I wanted to spice up the lunch box so I bought a multi pack of these children's favourites and wrote off the fact that they are probably usless in the nutrition department. This is what I got back today. She's a hyperactive brat on the way home. The little book that I got from the mum and baby in the church group across the way said that children often behave younger, baby even because all the growing up stuff of big school is quite a lot for them to digest. Not half! The book also says not to expect them to tell you everything that happened during the day as they are probably exhausted............not my daughter....she couldn't even if she tried! It's like shes on an upper! On the way home the line is. No Darling I will not carry you, you are at big school now and none of the other children are being carried home. Why are you behaving this way? OK.........Can I have a cuddle instead? So after she has behaved like a child on the way home she turns crazy and is unable to sit still or hold a conversation. We meet the teacher on Friday, oh my, she best be ready because I will have questions for her. Well our plan of action over the spring/summer was to argue the school placement decision but unfortunately our argument of ARE YOU BLOODY MAD! was not grounds for appeal and we were unsuccessful. Basically there are a large handful of families living in our city who live just out of the catchment areas for all their closest schools and are allocated a school which can be at some distance either by foot, car or public transport. These schools have no boundaries and will therefore pick up all children that are not placed. These schools tend to be under subscribed at the first hurdle. In my own opinion these schools struggle with their reputation because the parents are hanging on the waiting lists of the brighter schools desperate to pick up a vacancy, and I am sure that some of the families can't be bothered with participating in school life as they live at some distance away despite these schools over the last few years successfully doing everything they can to make themselves appealing. My initial snobbery about the school that we had been allocated has been stripped down to the fundamental fact it was important to us that T went to a school that was close enough that she could see it in her daily life and have a concept of where it was. Not the hour and a half bus ride with three changes that would be required for me and P to make multiple times daily for drop offs and pick ups. I have learned a lots this year and had this school been on our side of the city we would have accepted the place graciously. The only option open to us as we were quick off the mark is the local prep school, independent, private what ever you want to call it. It doesn't mean that it is full of local children but it looks hopeful. We are paying for her to attend her closest school and we are not buying a new car. So today is the first day and its been like Christmas and the weather is to match. School shoes - and they cost a fortune because her feet are still soft and dumpy she needs to be fitted properly they also have to be brown so you may as well double the cost but lovely. These are very dark brown but they are brown. Auntie Jaws came to the house and cut the wild hair she loves it. It's only the second cut that shes had. I spent yesterday sewing in labels. My mum sewed labels in my school clothes and made the most beautiful job of it. I still remember how perfectly neat it all was. It's been a thought at the back of my mind for years that I would be able to make such great effort for my children so I just can't bring myself to use the iron on labels. I decided to get her full name printed on the label which makes them incredible long (not quite Kennel Club length), but I feel that I have made a pigs ear of it despite G saying its fine and T being excited. Might secretly order new labels and start all over again. Pick up is at 3:15 is it too much to expect her to be able to tell me everything that happened. I am so excited for her. 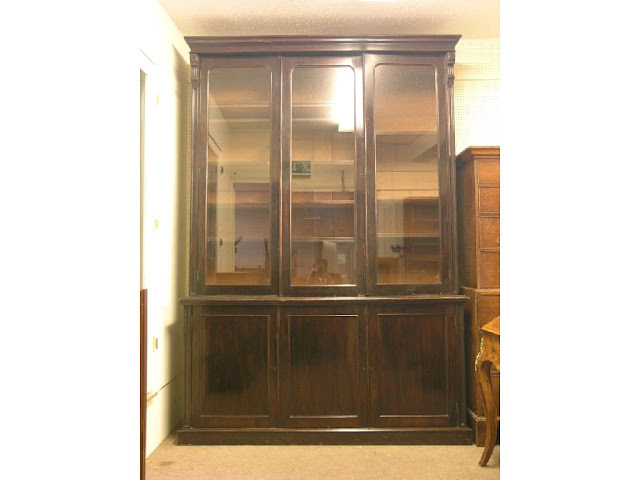 My mum tried to bid for this little gem at the auction this morning, It's eight foot tall and six foot wide and would be perfect in our lounge but we lost out, but are decided that we would like a large commercial/industrial piece for storage so if anyone sees anything let me know. Popped to the Dr. this morning I have a slight bronchitis problem so I am taking it easy. I have not been well this week and what my house needs now that T is away during the day is a fit and healthy home maker getting the hoover out. I think I might just curl up when P falls asleep and watch and old black and white. It's going to take all my enthusisim to make dinner this eve and I can see a culinary disaster on the horizon!